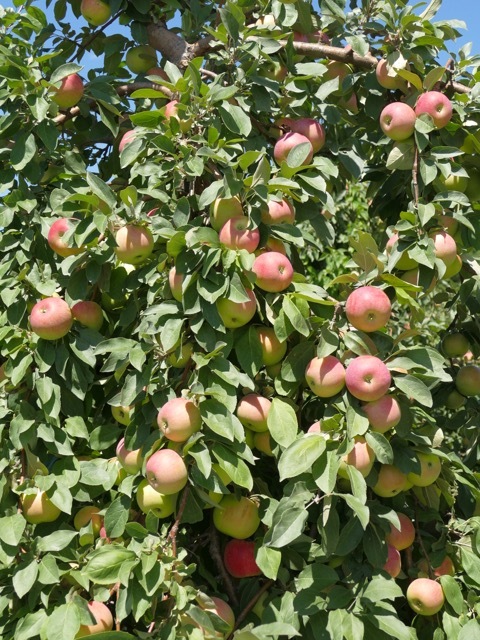 I was going to harvest some apples and test them for maturity today, but it simply does not feel like apple harvest weather. * So, I know Paulared are being picked. Sansa seems to have some pretty good background color change and should be looked at. Gingergold and Zestar!, you really should hold off on those for at least another week. 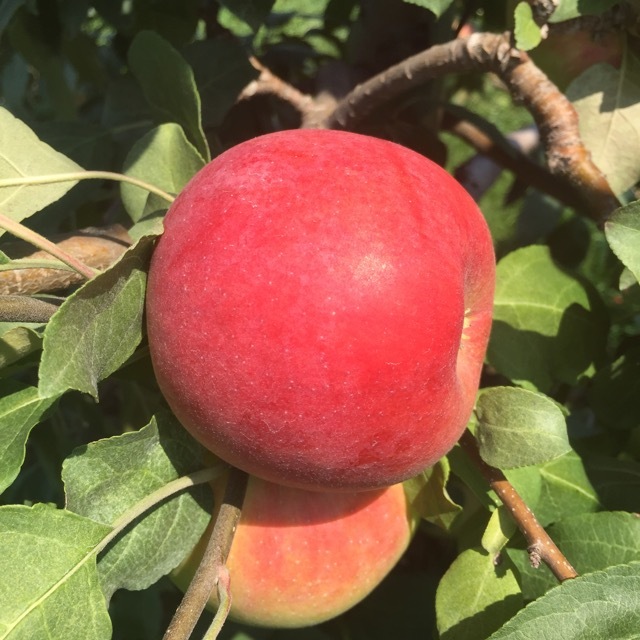 Beginning with the next Healthy Fruit (on September 1), I will start maturity testing of McIntosh, Gala, Honeycrisp, etc. 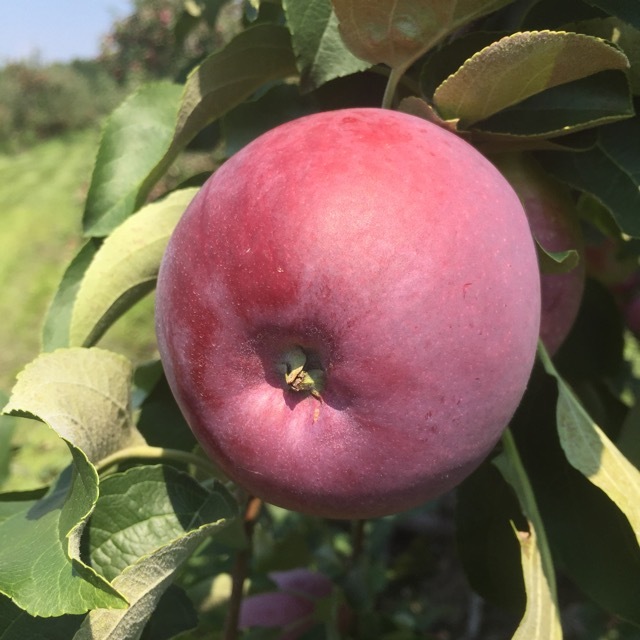 The peach harvest season is winding down, and all Redhaven, PF-14 Jersey, PF-15, etc. 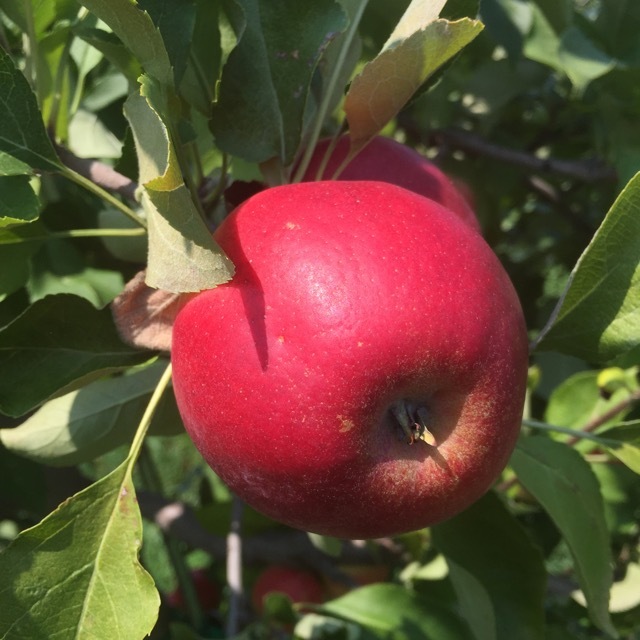 have been harvested at the UMass Orchard. Quality has been good and yields have exceeded expectations for most varieties. I have noticed very few stink bugs, native and including brown marmorated. We have yet (to my knowledge) to catch a BMSB in our trap network. By this time last year, I believe we had caught some. (Actually, on further inspection, it was not until the first week in September, 2014, that we caught BMSB in traps.) Stink bugs may become more numerous, but for now, very rare. I am sorry for several growers who got hammered by hail a couple weeks ago, they have a challenging harvest season ahead. I wish them good luck with it, and let's all keep our fingers crossed. 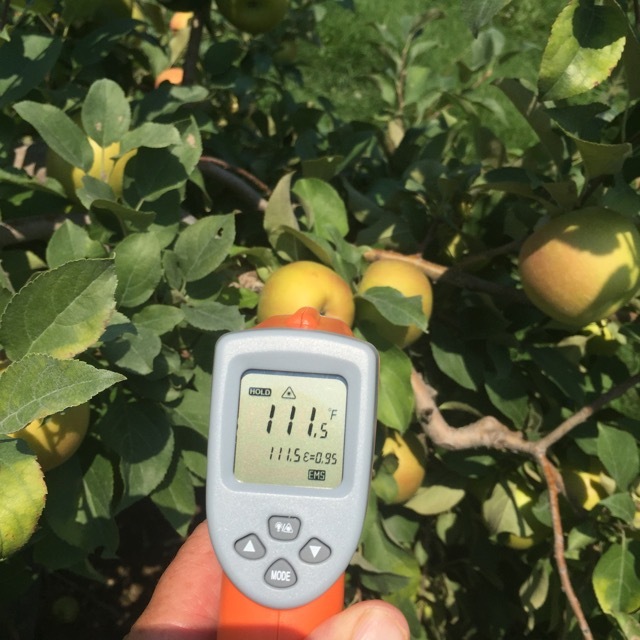 Although I hate to push growers to harvest early, it is a consideration to get the fruit off the trees as soon as you can to minimize weather-related risk issues. 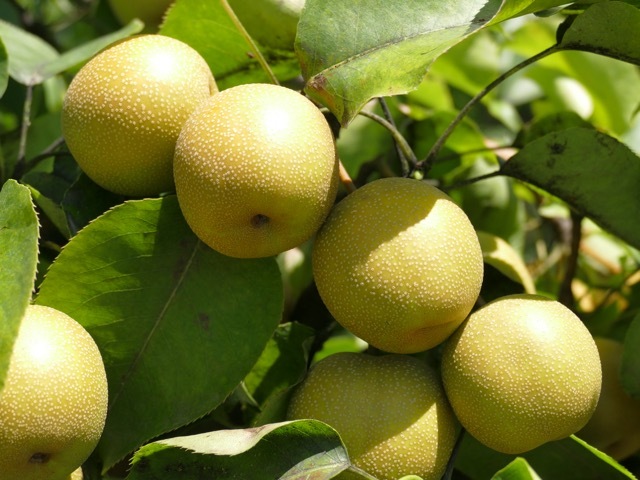 We have starch iodine solution for testing apple maturity using the starch iodine test, if you want any, let me know. Below, I will focus on some pictures I took last week of various issues I found. I hope you enjoy them, and feel free to let me know with any comments/insight. * OK, I broke down and did pick some fruit for testing. I was kind of surprised Sansa and Zestar! were as far along at this. Paulared, as I mentioned, are already being picked. 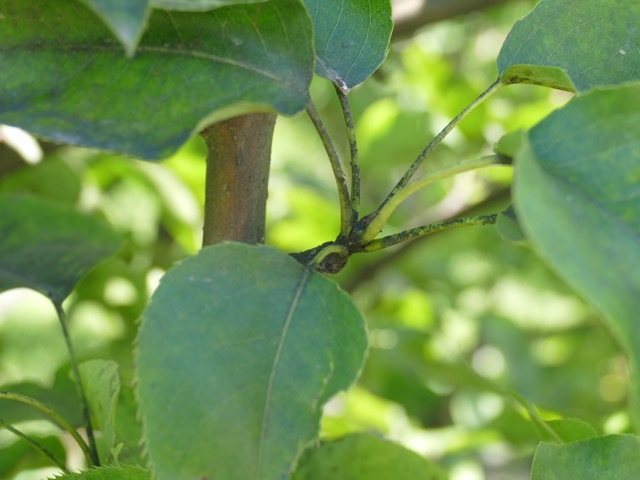 Signs of pear psylla infestation on Asian pear. Too late to do anything this year (I think), but I would be on top of it spring 2016. Ugh. 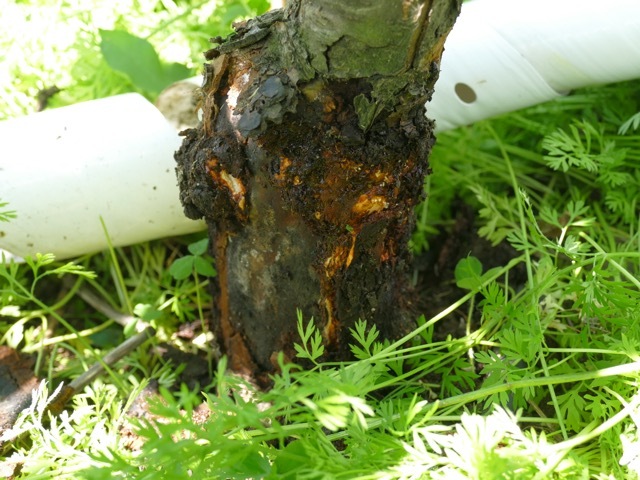 Over time dogwood borer infestation really becomes a problem on dwarf trees. PLEASE, if you use plastic mouse guards at planting, remove them after the 2nd-leaf. Also get rid of heavy weed cover in tree row. These two things are an invitation for borer smorgasbord. You really want to be able to see and monitor the base of your dwarf trees, and apply an insecticide (or use mating disruption) at the first sign of dogwood borer. Painting trunks white may help too. 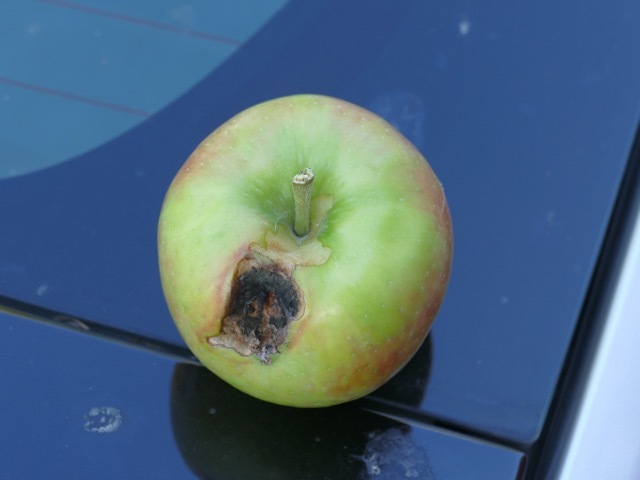 Macoun and Honeycrisp seem to be particularly susceptible. 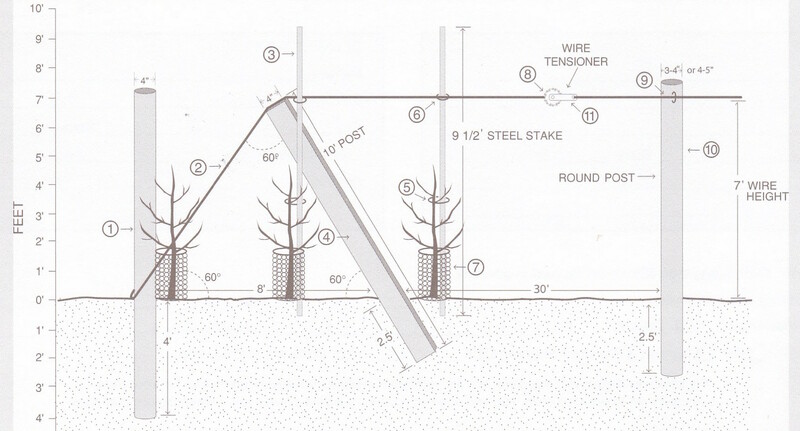 Tree weakness and/or death will follow dogwood borer infestation! I believe this is oblique banded leafroller (or some other leafroller) damage. Old and fairly fresh? 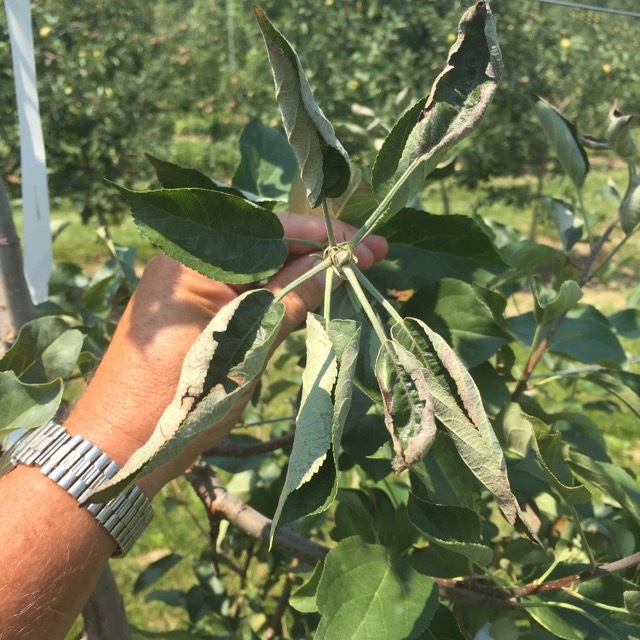 Unless you have them completely controlled, you might want to consider a late-season insecticide application for leafrollers. Options include: Altacor, Assail, B.t., Belt, and Delegate. All have reasonably short PHI's. 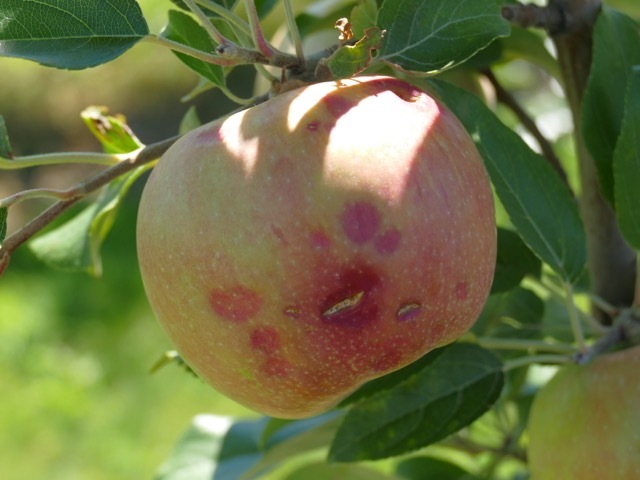 Assail and Delegate will also control apple maggot fly. Check out this nice illustration from Cornell's Peter Jentsch that should give you some more insight into management of internal leps as well as apple maggot fly (and when BMSB trap catpures peak). This would be another good one to hang up in the spray shed. Keep in mind we may be up to a week behind the Hudson Valley, but not much more than that. 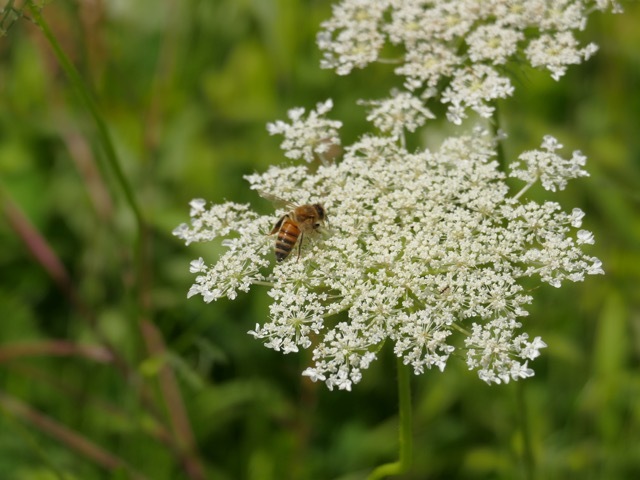 'Tis the season for queen anne's lace (Daucus carota). But, I don't particularly care to see it in the orchard ground cover where it attracts pollinating insects (such as this honeybee) that may be killed by insecticide sprays. Use least toxic (to pollinators) and spray in the evening to avoid. 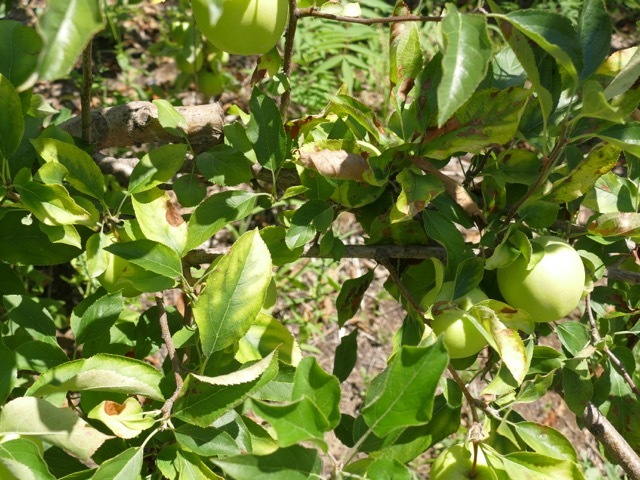 Or, get rid of flowering weeds (mow or herbicides) in the orchard! That is a good photo, you have to admit! 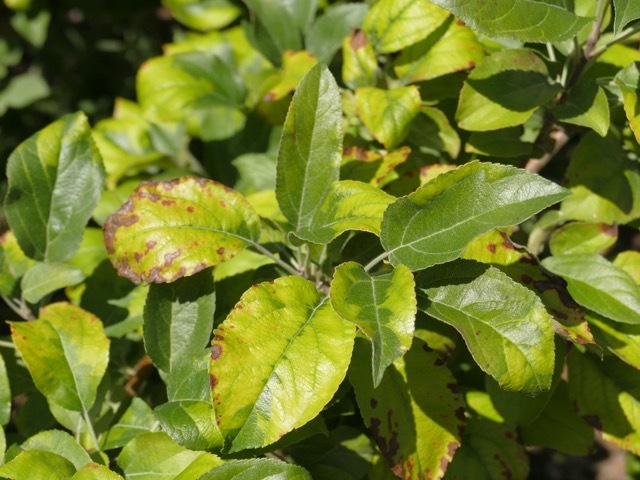 At first I thought this might be glomerella leaf spot on Golden Delicious apples, and it still might be, but I question potassium deficiency too as I saw similar symptoms on nearby red-skinned (Empire?) apples. 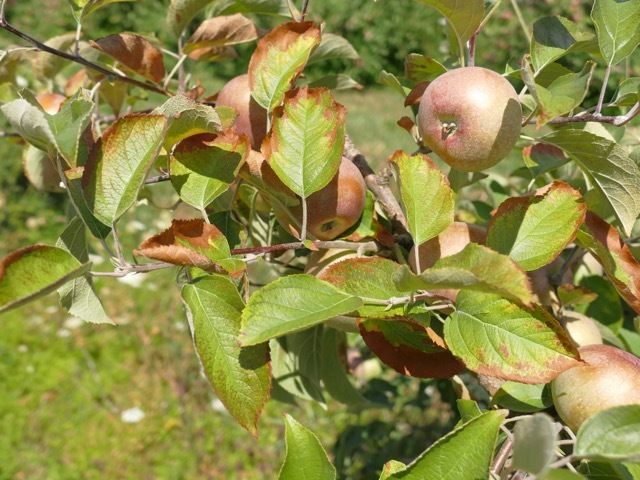 Honeycrisp yellows are common on under-cropped and what appear to be stressed trees. It has been shown there are issues with carbohydrate accumulation in the foliage, however, I wonder if it is potassium and/or magnesium related deficiency? Not anything to get terrible excited about, but I don't like it. 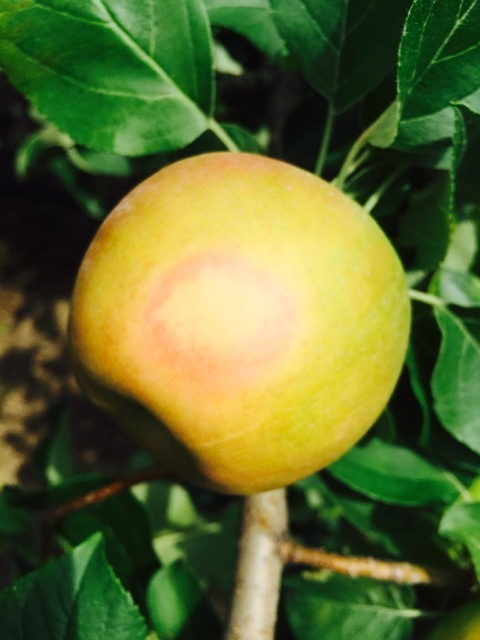 Pretty sure this is a severe case of potassium (K) deficiency on apple (Macoun). I am not sure how old it is, but I found this rather comprehensive publication from Spectrum Analytic, Fertilizing Apples. I have yet to see an orchard like this in Massachusetts. Can this level of cropping be maintained? 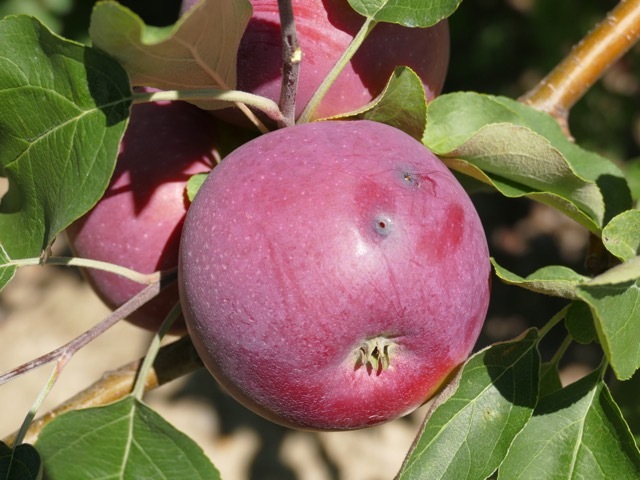 Could you sell an apple called Redlove Calypso? Anyone want to send me on an all-expense-paid trip to Switzerland to help this guy? 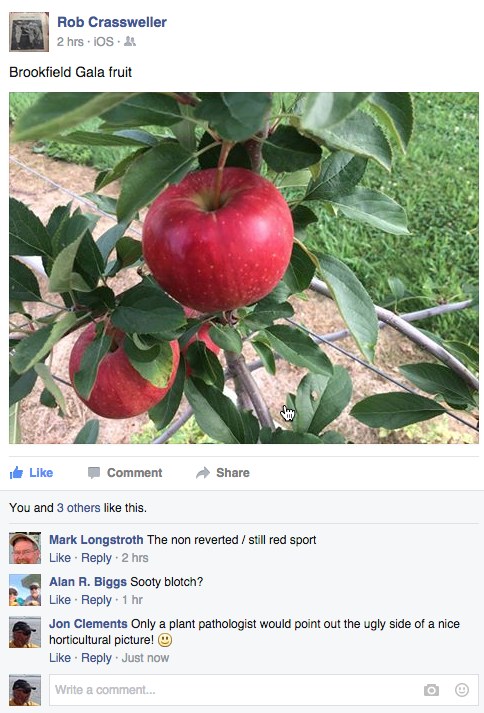 The next Healthy Fruit will be published on Tuesday, September 1or thereabouts, 2015. 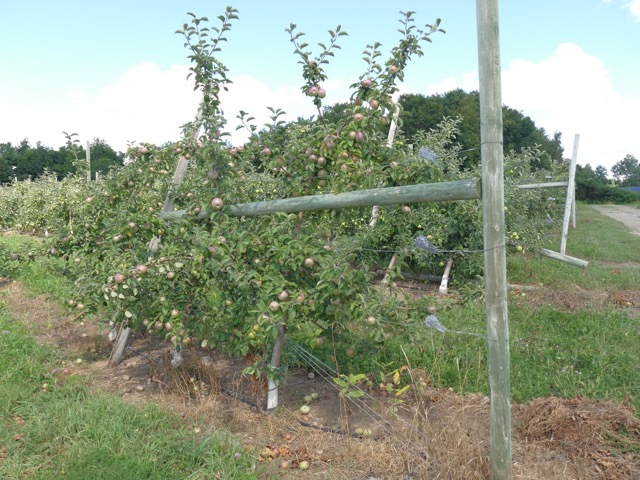 As always feel free to get in touch with any member of the UMass Fruit Team (http://extension.umass.edu/fruitadvisor/team-members) if you have questions or comments.